Back in January 2008, I made a New Year�s resolution to run a more active Top Ten list. Can I get a do-over on that? Rather than update it more frequently, I touched it less. I ran a chart in March and then� nothing. Why? For the same reason I waited until the beginning of February 2009 to compile this 2008 Top Ten: DVD releases just aren�t as exciting as they used to be. Forgive me if I sound like a grumpy old curmudgeon, but the DVD format has gone as far as it�s going to go. Any potential innovations now end up on Blu-Ray discs, and standard-def DVDs have become more ordinary. We still get plenty of good releases, but the jaw-droppers like the Lord of the Rings extended editions or the five-disc Blade Runner might have gone the way of the dodo. Here�s hoping that 2009 proves me wrong, but I doubt it. I expect more good but not great releases, and that means I�ll continue to be indifferent toward these Top Tens. At least this means my 2008 Top Ten won�t be predictable! Every other year, I knew pretty well what would lead my chart. Even after the headlock the LOTR flicks put on the top spot from 2002 through 2004, there was always something that seemed like the easy choice. As I type this, I�ve not actually compiled my chart, and I have no idea what I�ll pick as my number one DVD for 2008. 2009�s Top Ten may be different because this may finally be the year when I start reviewing high-def titles. For the last few years, I�ve polled readers and asked if they wanted DVD Movie Guide to go high-def or to stay with standard-def. The results indicated people wanted me to stick with SD, so that�s what I did. With Blu-Ray more popular than ever, though, that may change. Feel free to drop me a note with your thoughts. We�ll also run a more formal front page poll soon to better gauge opinions. I think only seven people read these comments, so hopefully a poll run on the main page will get me a wider array of thoughts. On a happy note, I want to mention that the start of 2009 marked the 10th anniversary as the site as I know it � meaning that�s when I joined. As a few people may know, Van Tran originally ran this site as a laserdisc page, but he moved to DVDs in the fall of 1998. He recruited me a few months later, and the rest is� well, maybe not history, but it�s whatever it is. Who knew it would last this long? I certainly didn�t expect it, and I sure won�t assume that we�ll still be up and running in 2019. But never say never, I suppose. It�s been a fun ride, and it�s opened up many opportunities I never expected. Thanks to all of our readers � loyal, antagonistic and everywhere in between � for the chance to rant, rave and spout inanities! Back when I first started to do Top Tens, Disney titles dominated them. Disney DVDs landed at the top in 2000 and 2001, and A Bug�s Life would�ve been number one for 1999 if I�d done a chart that year. As I alluded earlier, the LOTR movies then maintained a three-year stranglehold on the #1 position, and Disney hasn�t been back on top since then. Until now and WALL-E. Granted, the lack of any super-duper-killer-diller DVDs from 2008 opens things up; a DVD like WALL-E wouldn�t have won for any other year since maybe 2001. That shouldn�t be seen as a slam on this release, though, as it�s a fine affair � and a nice return to form for Pixar, as the DVDs for Cars and Ratatouille disappointed. WALL-E isn�t my favorite Pixar flick, but it�s entertaining, and the DVD itself is a terrific little package. That�s good enough for my top slot. Perhaps to make up for all those years that Disney failed to earn the top spot, they land positions one and two for the 2008 Top Ten. In terms of audio and extras, the old Nightmare Before Christmas special edition from 2000 was always very satisfying. I looked reasonably good, too, especially back in the days when 4X3 TVs were the rule; I actually placed it dhsakjdhgdsa on my 2000 Top Ten. Since it provided a non-16X9 transfer, however, it needed a new issue to now be viewed as a great DVD � and it finally got that reissue in 2008. The movie now looks terrific and provides a consistently satisfying release. You�d better get used to reissues in my 2008 Top Ten, as they dominate. I easily could�ve put the terrific Casino Royale in the number two slot. I went with Nightmare because it offered superior visuals, but then again, I think Royale provides the superior film. This is also a terrific DVD, as it gives us fine picture and audio along with many good extras. It�s too bad fans had to wait a year and a half after the movie�s initial DVD release to get a definitive edition, but better late than never, I suppose. For many other film buffs and me, every new David Fincher film is an event. (Or that was the case until Benjamin Button, but that�s a different story.) 2007's Zodiac lived up to expectations with a tight, gripping thriller that revisited the serial killer territory of Se7en but never felt like a rehash. This Director's Cut release packs excellent visuals, very good audio, and a strong collection of extras to become an top-notch DVD. Halfway through the Top Ten and we hit another Disney DVD! That�s three of the top five � not too bad for the Mouse. Sleeping Beauty is my least favorite of those three flicks; it�s lovely to look at but little more than a drab mix of Cinderella and Snow White. Nonetheless, this Platinum Edition of the film is a solid DVD. It improves on the prior release and offers consistently strong picture, audio and extras. It�ll never be one of my favorite Disney films, but it�s one of their better DVDs. When I compile these Top Tens, I don�t heavily factor movie quality into the placements. These charts are about the best DVDs of the year, not the best films; that�s why the disappointing DVD release for The Dark Knight is nowhere to be found. And that�s why The Godfather Trilogy shows up so high on my 2008 Top Ten. 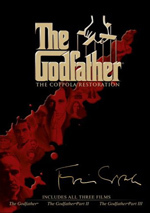 Unquestionably, The Godfather and The Godfather Part II are the best films in this year�s Top Ten. (Part III? Not so much.) I didn�t put this �Restored Trilogy� in the number 6 slot solely because they�re great flicks, though; the new DVDs offer substantially superior picture and audio when compared to the original discs from 2001. The added extras aren�t special, but since that was one area the 2001 package got right, I won�t complain. The �Restored� set may only be number six here, but it�s really the biggest �must own� package on the list. Like Casino Royale, this �Ultimate Collector�s Edition� of I Am Legend offers the release fans wish they�d have gotten in the first place. At least they only had to wait a few months and not almost two years in this case. Legend isn�t a great film, but it�s well-executed and compelling. I certainly can�t find much to knock in this fine release � except for the price, I suppose, as $50 is awfully steep. Still, it�s a nice package. As I mentioned earlier, I place movies in my Top Ten mostly due to the quality of their DVD releases. That�s why you find the often dull How the West Was Won in the number 8 slot. Oh, it�s not a bad movie, really, but it�s pretty mediocre; only the gorgeous Cinerama visuals make it interesting. And it�s great to see those visuals brought to life in such a fine fashion. The DVD provides really terrific picture, and the audio holds up very well after many decades. We don�t find lots of supplements, but what we get � a commentary and a long documentary � work nicely. West isn�t a great flick, but it turns into a satisfying DVD. 2007's Bee Movie came to screens with a great deal of hype. Though it didn't quite live up to its advance billing, it did provide a delightful and funny flick that works for adults and kids. The DVD provides excellent picture quality along with solid sound. The extras are a little disappointing but still pretty good. The movie never excels, but it succeeds. Speaking of movies that don�t excel but that succeed, that�d sum up Indiana Jones and the Kingdom of the Crystal Skull. I have no idea how I�ll compare it to the three other Indy flicks in the long run. I liked it theatrically and thought it might be better than Temple of Doom. (It�s not nearly as good as Raiders or Last Crusade.) My second screening revealed more flaws and left me doubtful that Skull will ever rise above the bottom of my Indy chart. We�ll see. It�s still tough to separate the actual movie from what we fans wanted it to be, so I reserve the right to change my mind in coming years. At least I can�t complain about the quality of the DVD. Okay, picture quality could be a smidgen better, but audio fares well, and despite the expected absence of an audio commentary � which are taboo on Spielberg DVDs � the extras flesh out the package nicely. All of this means that Skull deserves a spot on my 2008 Top Ten. For the statistically minded out there, I tallied the Top Ten by release dates. October was a big month in DVD, as three of the 10 titles came out that month. (October 2007 the single biggest month in the history of my Top Tens, as it generated five of the cited 11 titles; never before had one month contributed such a high percentage of a final chart. In case you're puzzled by the reference to 11 DVDs in my Top Ten, I had a tie with two Fantastic Four releases in 2007.) September 2008 provided two Top Ten releases, while five other months produced one Top Ten title each: January, March, August, November and December. For more statistical fun, I examined my nine Top Tens by studio. For that span, Disney wins with 23 of the 90 possible slots. 2008 marked a nice comeback for the Mouse, as they placed no titles on my 2007 chart. With two 2008 Top Ten titles, Warner Bros. passed Fox to get the number two spot. Fox comes in third with 15 DVD, though they scored a goose egg in 2008.